The dissension between The Bullet Club Firing Squad and The Bullet Club Elite is turning out to be one of the most intense rivalry of the year and earlier today on Twitter, the war between the group's continued as Cody Rhodes and Tama Tonga traded blows on the social media. After initially forming The Firing Squad at The G1 Specials in San Francisco, former three-time IWGP Tag Team Champion Tama Tonga, alongside his fellow Bullet Club Firing Squad members have made it to the news for all the controversial reasons, thanks to their recently developed notorious behavior in NJPW. Throughout the entirety of the recently concluded G1 Climax Tournament, The Bullet Club's Firing Squad developed a very notorious reputation, all thanks to their regular interference in almost every single match in this year's G1 Climax. The trio of Tama Tonga, Tanga Loa, and Bad Luck Fale constantly made their presence felt in high stakes matches and caused an issue with almost every single member of the NJPW roster, including the likes of Cody Rhodes and Kenny Omega. 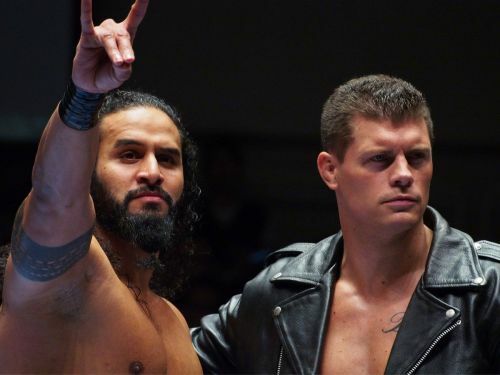 The recently ignited war of words between Tama Tonga and Cody Rhodes initially started when the former put out a video on Twitter stating that he and his fellow Firing Squad members are looking to recruit new superstars to The BC Firing Squad. 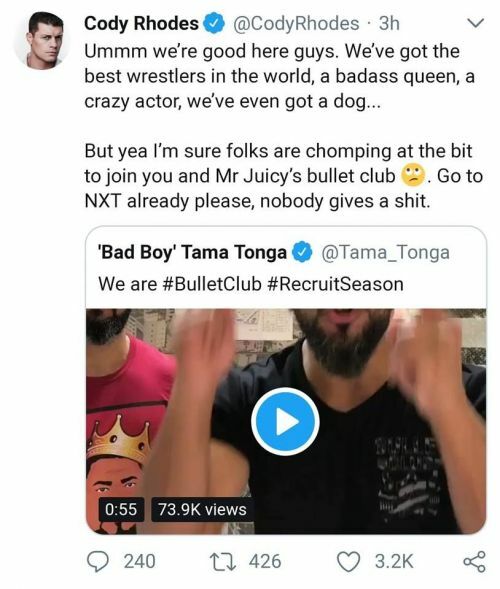 Cody, who over the past few months has developed himself as one of the more prominent members of The BC Elite, responded to Tama's recruiting efforts by stating that The Bullet Club currently got the best wrestlers in the world, a badass queen (referring to Brandi Rhodes), and even got a dog. In addition, Cody also mocked another one of Bullet Club's new members, Mr. Gino 'Juicy' Gambino and eventually asked 'The Bad Boy' to head down to NXT already. However, Tama subsequently also responded to Cody's claims by assuring that he and his crew aren't going anywhere and are pretty loyal to NJPW. Cody Rhodes is currently slated to challenge for the IWGP US Championship at NJPW's next show in the US, Fighting Spirit Unleashed at Long Beach, California, where Cody goes one-on-one with Juice Robinson. Meanwhile, Tama Tonga and Tanga Loa will be challenging The Young Bucks for the IWGP Tag Team Titles at the very same show.